Your bathroom counters are IMPORTANT! Not only do they need to look nice, but they must be able to withstand water, soap, cosmetics, and any other guck that gets into your bathroom. That being said, it’s essential to recognize when your countertops should be switched out for some fresh ones. If your bathroom countertops are due for a replacement, there are plenty of choices to select from. But how do you know which ones are the right fit for your lavatory? We’ve broken down the pros and cons of the most popular bathroom countertops so you can decide which should be installed into your home. A stone countertop is as durable as it is beautiful. They’re especially popular in kitchens, but due to its durability, granite and marble are becoming a popular choice for bathrooms. 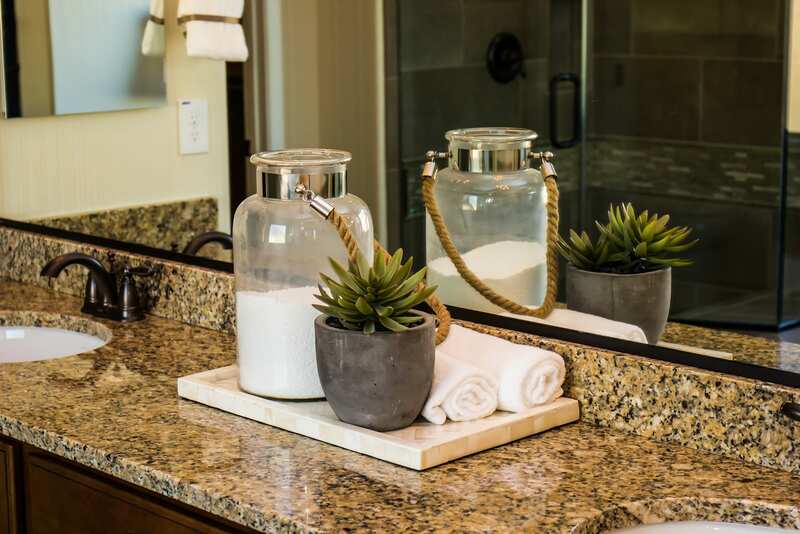 Stone counters can survive the humidity, steam, and moisture that accumulates in a bathroom without losing its shine. 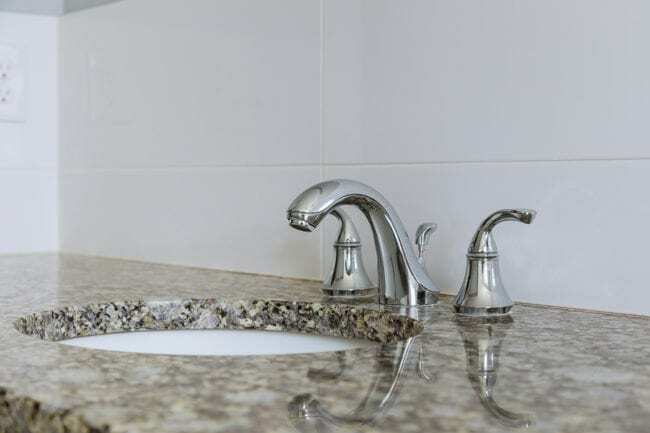 Granite and marble are also scratch and stain resistant, so you won’t have to worry about ruining your countertop when you spill your nail polish. On the downside, these giant slabs of rock are heavy so installing them is quite the process. 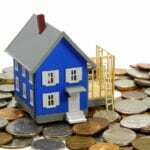 Stone countertops are costly and must be properly sealed. Laminate is another go-to bathroom countertop option. Gone are the days of metal-edged laminate countertops that weren’t too pleasing for the eyes. Today, manufacturers have a variety of styles and designs so you can select one that looks gorgeous and matches your bathroom. Laminate is affordable as well as durable. It can withstand a decent amount of water and stains without losing too much of its shine. Keep in mind when considering laminate that it’s not as durable as stone. While it can withstand a bit of water and some scratches, laminate countertops may burn and dent when under pressure. If you want to go traditional, then tile is your choice. With so many diverse styles and designs, tile offers many creative possibilities for your bathroom countertops. Tile is affordable and heat resistant, which is why it’s a popular choice for kitchens. If you’re looking for a countertop that can withstand the heat of your hair appliances, tile is the way to go. Installing tile can be difficult and it’s susceptible to chipping if you’re not careful. You must keep grout lines clean so grime and dirt don’t build up. Keeping up with proper maintenance on your tile countertops is important so your colors don’t become discolored and lose their shine. 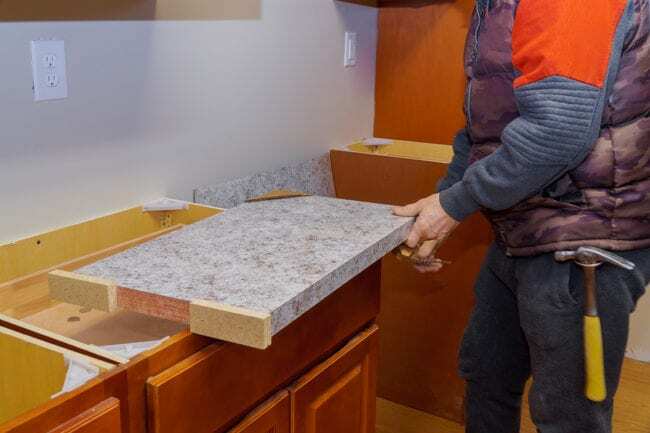 NEED A HAND WITH YOUR COUNTERTOPS? Let the bathroom remodeling experts at Eagle Construction get you the bathroom countertops you need!